We’ve established that the goal of a Zoo deck is to secure a quick win early game. It does this by asserting strong field presence and forcing the opponent to make suboptimal decisions to protect their life points. Zoo decks generally don’t run late-game cards that are suboptimal early-game, while other decks do. If you can outsurvive a Zoo deck for 5+ turns, you’ll likely be able to generate long-term advantage to counter it, but this process begins with replacing cards in your deck that aren’t strong against Zoo and replace them with cards that either counter them or at least can engage. Cards to consider siding out: Airknight Parshath, Morphing Jar, Book of Moon, Nobleman of Crossout, Call of the Haunted. This picture is an example of the cards a typical Goat Format deck might side out. * Nobleman of Crossout is sided out because Zoo decks don’t set monsters (they could be totally dead in hand). Though I do understand some Zoo players will side in flip effects game 2 because they expect Nobleman to be sided out, but its still a risk. * No Morphing Jar because we don’t want Zoo players to see more cards. * Book of Moon is generally disadvantageous against Zoo. Zoo doesn’t use Thousand-Eyes Restrict, so Book’s utility is reduced. It may be good at stopping the lockdown effect of King Tiger Wanghu, but there are downsides to Book. If you Book down an enemy beater, you are forced to attack next turn while they may have battle traps set down. You still need another card to destroy the monsters you set with it, so it’s a risk of a -1. * Asura Priest’s ATK is low and it returning to your hand opens you up for direct attacks. * Airknight Parshath’s reliance on battle is countered by Zoo’s battle trap and the fact that it’s a tribute monster bricks it opening hand. * Between Call of the Haunted and Premature Burial, I wouldn’t necessarily take out both of them but I would take out one of them they are more possibilities of things that could go wrong turn 1: revival cards are useless early-game if the monsters you open are flip effects, for example. Also, since we’re taking out Airknight Parshath, these cards have less utility anyway. If you’re siding out both Asura Priest and Airknight, you’ll probably want some LIGHT monsters in the side deck to replace them with. It’s true that BLS is not great early game, but it’s one of those cards that can outright shut down Zoo because they have nothing that can get it over with. 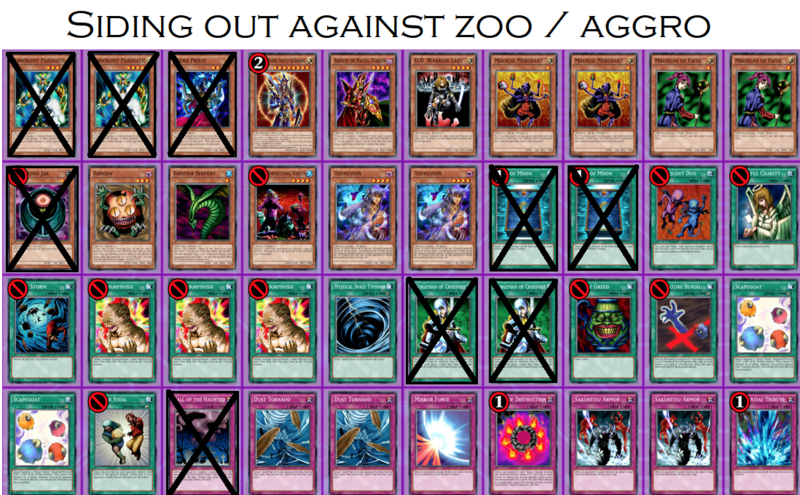 These are the following cards that can be considered against Zoo. Some of these outright counter the deck, while others simply trade 1-for-1 against it to help offset the enemy’s summon advantage. Removal: Sakuretsu Armor, Smashing Ground, Bottomless Trap Hole, Lightning Vortex, Exiled Force. Tribute monsters like Jinzo and Mobius the Frost Monarch can counter Zoo by disabling their traps and overpowering them with their strong ATK. However, the fact that they’re tribute monsters and still bad turn 1 draws makes them risky cards to side in.